SAMHSA created National Children’s Mental Health Awareness Day to shine a national spotlight on the importance of caring for every child’s mental health and to reinforce the message that positive mental health is essential to a child’s healthy development. The purpose of Awareness Day is to increase public awareness about the needs of children with serious mental illness and severe emotional disturbance and their families, to provide information on evidence-based practices, and to encourage those who need help to seek treatment. This year’s Awareness Day theme is “Suicide Prevention: Strategies That Work,” and SAMHSA will focus on the impact suicide has on children, youth, young adults, families, and communities. On Thursday, May 9, 2019, more than 1,100 communities and 170 national collaborating organizations and federal programs across the country will participate in community events, youth educational programs, health fairs, art exhibits, and social networking campaigns to connect those in need to information, services, and supports that can save lives. can be found at the Centers for Disease Control and Prevention website. Youth Mental Health First Aid—Oak Hill Methodist Church is hosting this training on Tuesday, May 7, 2019, from 8:30 a.m.-4:30 p.m., at Oak Hill United Methodist Church – Fellowship Hall, 2239 NC 181 Morganton, NC. A young person you know could be experiencing a mental health or substance use problem; learn an action plan to help. Youth Mental Health First Aid is highly recommended for teachers, coaches, social workers, faith leaders, and others who regularly have contact with young people ages 12-18. Sometimes first aid isn’t a bandage or CPR or calling 911. Sometimes, first aid is YOU. Register online by Friday, May 3, 2019. You must be at least 18 years old to attend. For more information contact Kim Rhoads at 828-323-8049 or krhoads@partnersbhm.org. Family Acceptance Project: Family Support for LGBTQ Youth—The purpose of this training is to engage families, foster families, and caregivers to prevent suicide and homelessness for LGBT youth and engage families as Allies to promote school safety, support, and wellness for LGBT students. May 6: 9 a.m.-4 p.m.
Open to anyone in the Community interested in engagement and acceptance of youth in the LGBTQ+ community (providers, schools, juvenile justice, families, doctors, DSS, and others). Registration and payment are online. Open to families and youth (caregivers, parents, foster parents, aunts, uncles, grandparents, guardians, children, youth, young adults). Registration is Free. Please, RSVP to Cbrown@ncfamiliesunited.org. Trainings will be held at First United Methodist Church of Elon, 1630 Westbrook Ave., Elon, NC 27215. Buffering Toxic Stress—The Buffering Toxic Stress training provides information about early childhood stress and trauma, specifically as related to brain development, learning, behavior and increased risk of long-term adverse health effects in adulthood. Training is Thursday, May 9, 2019, from 9 a.m.-12 p.m., at Partners Basement Multipurpose Room, 1985 Tate Blvd. SE, Hickory, NC. Please register online by May 7. You must be 18 or older to attend. For more information, email Kim Rhoads at krhoads@partnersbhm.org. Getting in touch with Access to Care department should be you first call for services or information. Staff can help you get an assessment and help you figure out if you get services through Medicaid or if you have access to services through state and local funding. If you receive Social Security Insurance, Special Assistance to the Blind, Work First Family Assistance, or Special Assistance for the Aged or Disabled, you are automatically eligible for Medicaid. Next, you will choose a behavioral health care provider to see. Based on your answers and the services you are eligible for, you choose from a list of behavioral health care providers who can help you. You have the right to choose and change your provider at any time. If you ever want to search our entire network of providers, use the Provider Search Tool or Provider Directory. We will help you schedule your first appointment. Attend your appointment. At your first appointment, your new health care provider will identify the problems you are having with your behavioral health. You and your provider will determine what care or treatment you want to start. Then, just like an insurance company, Partners will agree to pay your provider for the services you need. needs qualify you for services through medical necessity requirements. You are now on your way to treatment and recovery. Partners, your service providers, and community organizations are there every step of the way. If you have any questions or concerns, call us anytime at 1-888-235-HOPE (4673). Find out much more about medical necessity, available services, appeals, and your rights and responsibilities at https://www.partnersbhm.org/get-services/. You can reach us toll-free, 24 hours a day, 7 days a week, 365 days a year at 1-888-235-HOPE (4673). This number gives you access to a licensed clinician, has no cost, and is confidential. The Western Piedmont Regional Transit Authority has extended free fares for the Burke County Flex Routes. Routes 21, 22, 23, and 24 are free from now until August 30, 2019. So keep riding, going places, and enjoying your public transit services in Morganton and beyond! for more information, call 828-465-7634. The Iredell County Adult and Child Collaboratives invite you to kick off May is Mental Health Awareness Month with a day of fun, food, and family. This community event is on Saturday, April 27, from 10 a.m.-1 p.m., at Fairview Baptist Church, 349 Turnersburg Hwy., Statesville, NC. Family Fest is a celebration of learning, health, and our community! The goal is to provide a day to bring families and our community together and to raise awareness of the services and activities available in Iredell County. There will be information about local services that address mental health, substance abuse, and other support for our families. Bring your friends and family and enjoy over 30 vendors, local performers, a DJ, bounce houses, giveaways, food trucks, and more! We are UNSTOPPABLE. You are not alone. We walk alongside of you. From Hope to Wellness, from all walks of Life with Mental Illness. 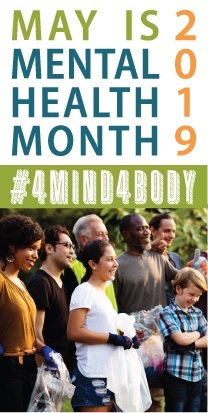 The National Alliance on Mental Illness-South Mountains, NC is hosting Mind Fest to support community health, on Saturday, May 18, 2019, from 11 a.m.-3 p.m., at the Spindale House, 119 Tanner St., Spindale, NC. Dance with the “The Dancing Fleas Band,” meet firemen and see the fire truck, meet service dogs and their owners, talk with folks from the humane society, learn to make your own stress ball, “gardening” plant your own flower, paint on canvas, participate in gym activities, look at Mary Kay products, eat healthy Pampered Chef, and meet author Robbie Taylor and Dr. Sarah Merrison-McEntire, CEO and Owner of Carolina Chiropractor. A daily summer camp dedicated to Gaston County citizens ages 7 and up with developmental disabilities. Camp Kaleidoscope is 7 1/2 weeks of safe, educational, and enriching fun, running June 19-August 8, 2019, Monday-Thursday, from 9 a.m.-3 p.m., at Saint Mark’s Episcopal Church, 258 W. Franklin Blvd., Gastonia (corner of Franklin and 321 North). Applications are available online at www.gastoncountyarc.org/kamp-kaleidoscope/. You can also contact The Arc office at 704-861-1036 or kamp@gastoncountyarc.org. Individuals with mental illness and individuals leaving incarceration are diverse groups of people with a wide range of talents and abilities seeking employment. Most individuals with serious mental illnesses express a desire to work, yet employment rates for this demographic are estimated to be only twenty-two percent. Many reentering the workforce from jail are disqualified for employment before they can share their skills. With national data indicating 1 in 3 adults have a criminal record, you could be missing out on many qualified applicants. Employment provides more than a paycheck: a sense of purpose, opportunities to learn, and a chance to work with others. Most importantly, employment offers hope, which is vital to recovery from mental illness, and provides a fresh start for those at-risk. As a part of the Disability and Reentry Employment Summit, we invite you on Thursday, May 30, 2019, from 7:30-9:30 a.m., at the Gastonia Conference Center, 145 Dr. Martin Luther King Jr. Way, Gastonia, to explore ways your business could be missing out on qualified applicants and learn how to participate in equitable hiring. The summit is free and Breakfast will be provided to all registered attendees. This event is hosted by Partners Behavioral Health Management, in partnership with NC Commerce, Gaston Regional Chamber, Gaston College, Vocational Rehabilitation, Goodwill, Gaston County School District, Monarch, Inc., and Coastal Southeastern United Care. Register online, or contact Ryan Shuford at RShuford@PartnersBHM.org or 704-884-2579, for more information.